The 19th-seeded ’88-’89 Calgary Flames upended the #3-seeded ’07-’08 Detroit Red Wings in an intensely close series. Only Game’s 4 and 5 were decided by more than one goal, with only the deciding Game 6 going to overtime. The Red Wings survived a furious rally from the Flames that included three third period goals to hang on for the win, behind a hat trick from Henrik Zetterberg, and then the Flames took a low scoring affair in Game 2 to tie up the series, with both of their goals coming from Joe Nieuwendyk . In Game 3, the teams partied like it was Game 1 with the Flames getting a power play goal early in the third to clinch the game. The Flames clipped the Red Wings in Game 4 with a big 6-3 win , with four goals in the third period, and then the Red Wings doused the Flames in Game 5 with a 5-2 win, with four goals in the third period. Team exploding for more than three goals in a period happened quite often in this series and happened in a big way in the deciding Game 6. The Flames led Game 6 by a score of 5-3 after just the first period of play. However, the Red Wings potted a goal each in the second and third period to force overtime. 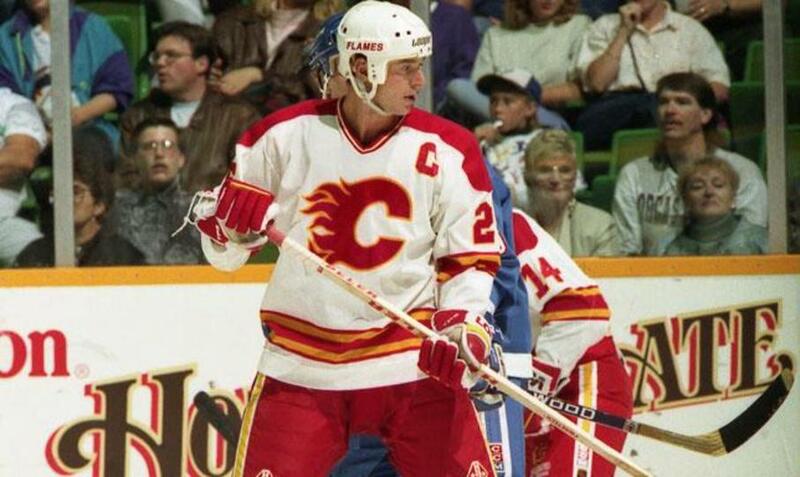 The Flames finally ended the series in double overtime with a late goal from Nieuwendyk. The Red Wings were led by their twins in this series who posted a combined total of 25 points in the six games. Pavel Datsyuk led all skaters in points with five goals and nine assists for 14 points and Zetterberg was right behind him with seven goals and four assists for 11 points. Datsyuk’s fifth goal was the goal that sent Game 6 into overtime. A smattering of other Red Wings registered points, but both Datsyuk and Zetterberg drove Detroit’s offense. Detroit only had a single player to post a plus/minus rating above even and that was longtime Red Wing Dan Cleary, and he was only a +1. In net, Chris Osgood did not have a good series. He posted a weak .875 save percentage and a 3.83 goals against average, both were kind of expected, however, with how well the offenses were playing. Like most of their tournament so far, the Flames scored a lot of goals and created a lot of offense. They were led by the Game 6 double-overtime hero Nieuwendyk, who scored goals in bunches in this series. He notched five goals and four assists for nine points in the series, which was the most on the Flames. Right behind him was center Doug Gilmour who posted three goals and five assists for eight points. Winger Hakan Loob and defenseman Al MacInnis posted seven points each to finish right behind both Gilmour and Nieuwendyk. Unlike Detroit, Calgary had multiple players finish above even in plus/minus with defenseman Brad McCrimmon leading the way at +5. McCrimmon, by the way, is the tournament leader in plus/minus. Goaltender Mike Vernon had posted two solid series’ before facing Detroit, but struggled against the Red Wings. He posted nearly identical numbers to his counterpart, Osgood, with a 3.83 goals against average and a .899 save percentage. The 19th-seeded ’88-’89 Calgary Flames pull off the upset to advance to the Quarterfinals to face the winner between the 6th-seeded ’12-’13 Chicago Blackhawks and the 11th-seeded ’96-’97 New Jersey Devils. Up next in the 3rd Round is a matchup between the 18th-seeded ’06-’07 Anaheim Ducks and the 34th-seeded ’10-’11 Nashville Predators. This entry was posted in 3rd Round, Ultimate NHL Playoff and tagged 3rd Round, Al MacInnis, Brad McCrimmon, Calgary Flames, Chris Osgood, Dan Cleary, Detroit Red Wings, Doug Gilmour, Hakan Loob, Henrik Zetterberg, Joe Nieuwendyk, Mike Vernon, Pavel Datsyuk, Ultimate NHL Playoff. Bookmark the permalink.